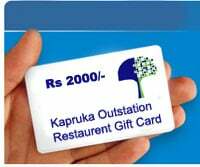 Select from our growing list of out of Colombo restaurants that accept Kapruka gift cards. These come handy when you can not order freshly cooked food to out of Colombo areas. Famous in Gampaha Area. Off of Colombo road. In the heart of Negombo Area on Custom House road. In the heart of Kaluthara Area near Privena Junction. In the heart of Kurunagala.